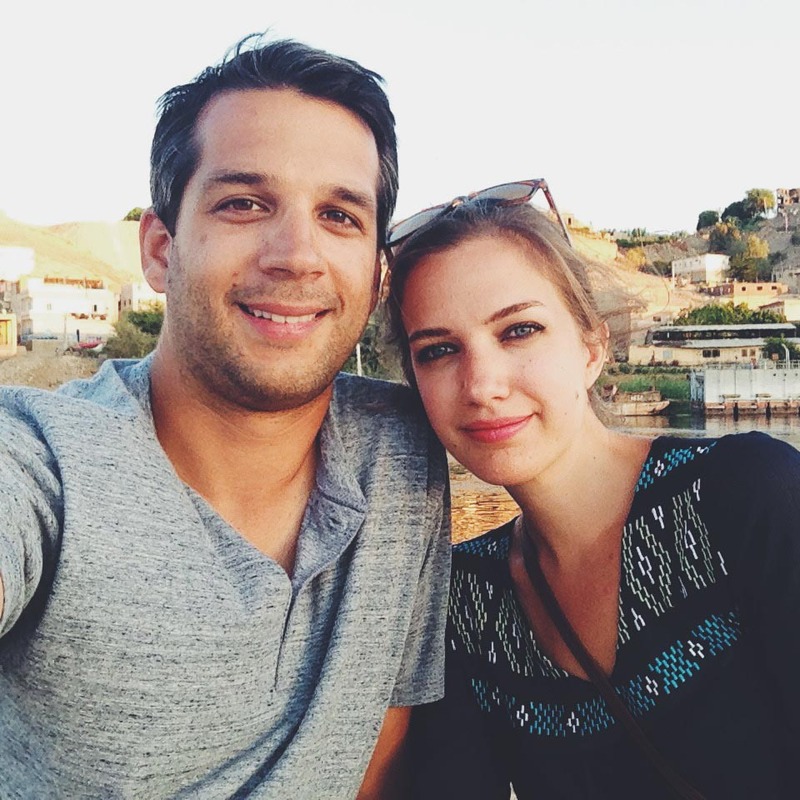 When planning our 2013 trip to Turkey we knew that Ephesus was a must-visit destination. The question was, where we were going to access Ephesus from. 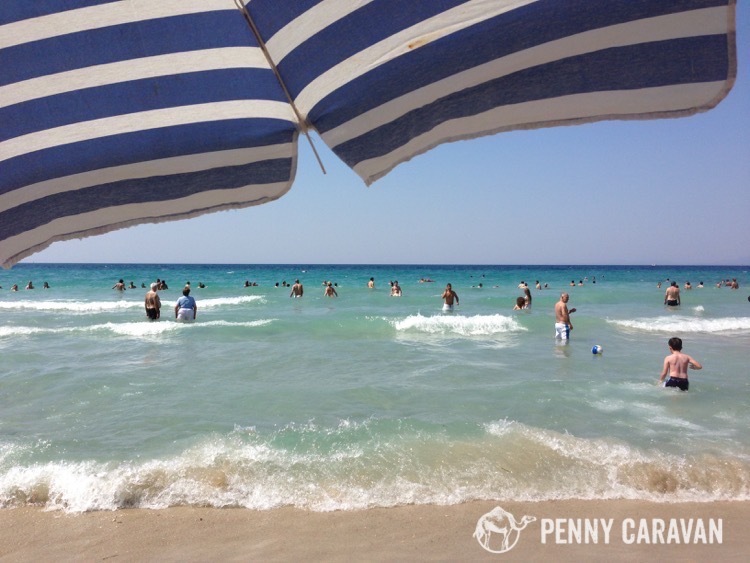 You have a few options: day trip from Izmir , stay in nearby Selçuk, or base out of Aegean resort town Kuşadası, which to us seemed the best choice, as we were able to work in some relaxing beach time into our larger Turkish adventure. Kuşadası (pronounced koosh-a-dah-seh) is a popular resort destination for Turks, and also attracts a number of visitors from other European countries for its beaches and coastal Aegean charm. We stayed three nights in Kuşadası, so our recommendations are based off that duration of a stay, but there’s still plenty that can fill a longer itinerary. The best way to get to Kuşadası from Istanbul is by first flying to Izmir, then taking a roughly 45-minute bus ride. To do this, upon arrival in Izmir, look for the bus that will transfer you to the main bus station. There purchase a ticket for 17 TL ($6) to Kuşadası. We chose the Pammukale bus company, which had clean, modern buses with free wi-fi and complimentary beverage service. Kuşadası isn’t terribly big, and it’s easy to walk end to end in under an hour. You can get from Ladies Beach to the Old Town in half an hour. Taxis are also an option and readily available, but to save a few lira use the dolmuş (shared taxi minibus). The dolmuş stops are marked, but you may need to ask the driver where they are heading to ensure you get on the right one. There are a number of resort properties to stay at, as well as numerous hotels and inns with easy access to its public beaches. We enjoyed our stay at the Hotel Carina for its affordable price and convenient location. 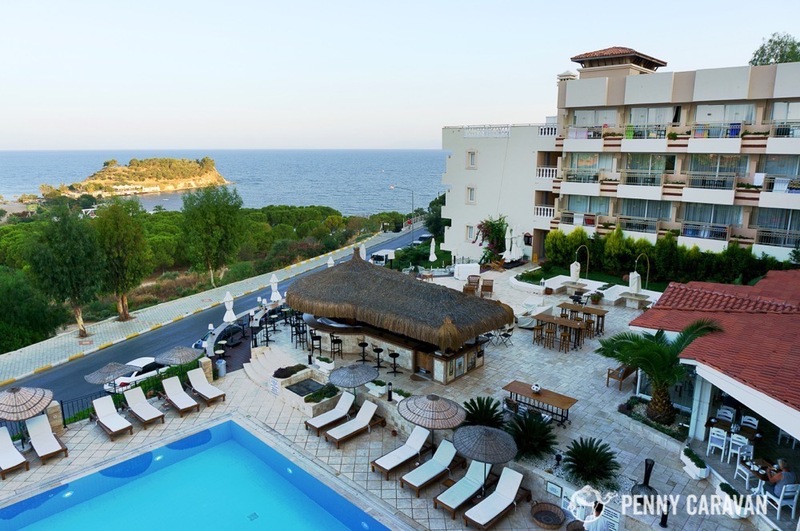 We enjoyed our stay at Hotel Carina, with a great view of Pigeon Island and Aegean sunsets. 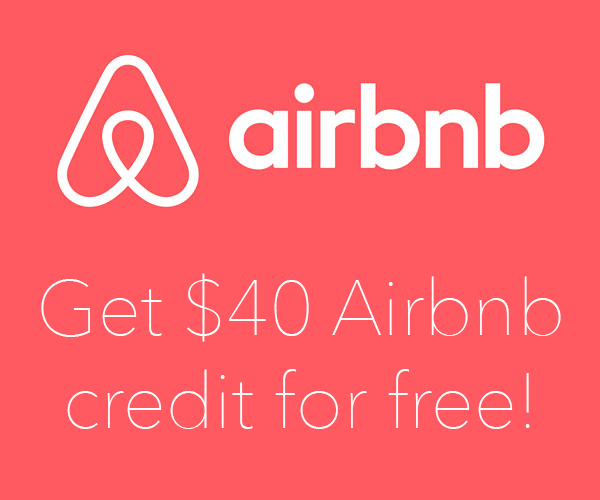 There are two areas you’ll likely want to focus on, especially for a shorter stay. Ladies Beach is the popular public beach. Don’t be confused by the name, it is open to everyone. It’s about a kilometer in length, but can still get fairly crowded. Expect to have to pay a few lira for a chair with an umbrella. The other area to visit is the Old Town. Here you’ll find shops selling all the traditional Turkish crafts, as well as being in close proximity to the cruise port which has a few more upscale, international shopping options. 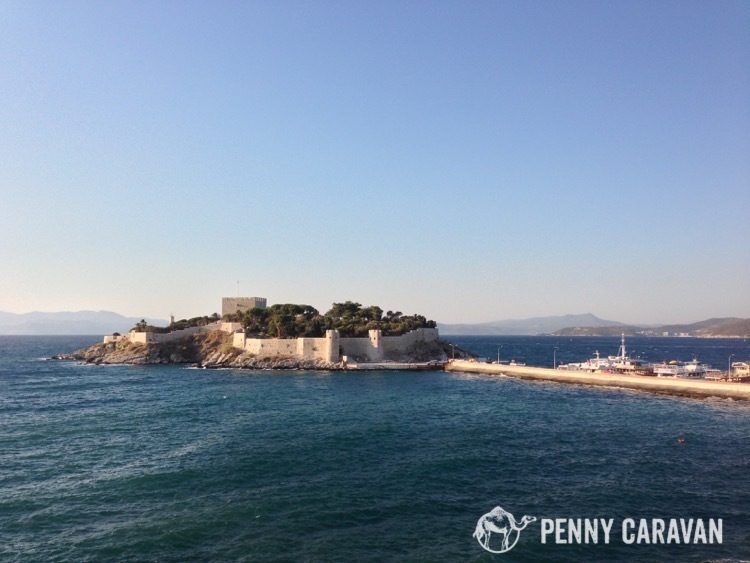 Another place to check out is Pigeon Island, a small island fortress just off the coast between the Old Town and Ladies Beach and from which Kuşadası gets its name (“Kuşadası” literally means “bird island”). You can easily walk to Pigeon Island, as it is connected to the mainland by a jetty lined with dinner cruise boats. And as previously mentioned, Kuşadası provides an ideal base for exploring nearby Ephesus. Read our post on Ephesus for a more detailed look on visiting this important ancient Roman city. 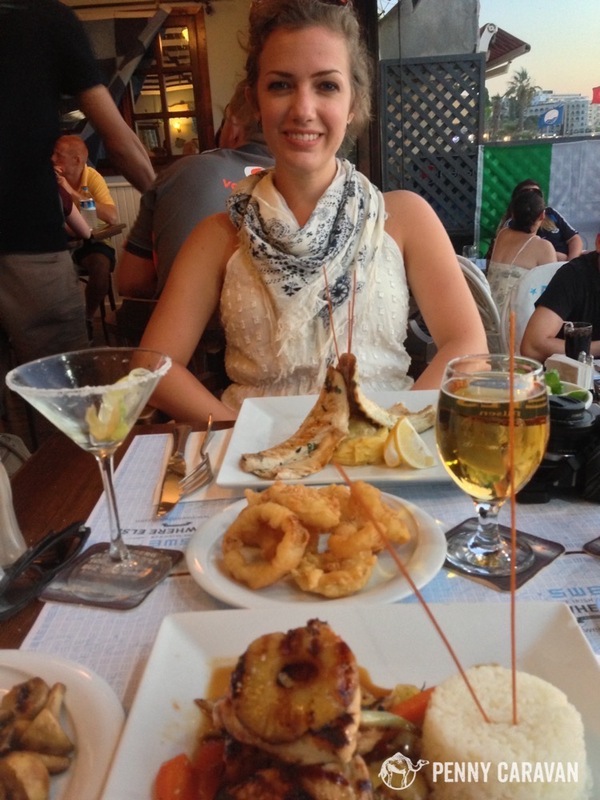 Both Ladies Beach and the Old Town have a bevy of dining options featuring traditional Turkish cuisine as well as international offerings for the many vacationers that come here. At Ladies Beach we enjoyed the Irish pub Somewhere Else so much that we ended up going there three times during our short stay. The English breakfast is highly recommended! Delicious seafood and drinks at Somewhere Else Irish Pub. Kuşadası is the second busiest cruise ship port in Turkey after Istanbul, and taking day trips to Ephesus is the most popular activity for cruise passengers. You can go with a tour organized by the ship, or easily make the trip on your own. From the cruise ship port take a taxi or look for a dolmuş (minibus) going to the central bus station. From there you can take a bus or minibus to Selçuk. Before you arrive at the Selçuk bus station there will be a stop to let people off at Ephesus, which is just outside the village of Selçuk. From the stop, it can be quite a hike to get to the entrance to Ephesus, so there will be many taxis waiting to take tourists there, but they will try to add in trips to the Seven Sleepers Church and House of the Virgin Mary as well to increase the fare. Another option is a carriage ride, which is what we opted for, which also stopped at the Seven Sleepers and dropped us of at the second (uphill) entrance to Ephesus, allowing us to work out way back downhill toward Selçuk. The ancient city of Ephesus is the main attraction of the area. To get back to your ship, take a bus from the Selçuk central station back to Kuşadası and take a minibus or taxi to the cruise port. Finish off the rest of your time in Kuşadası by hanging around the old town, or walking to Pigeon Island, after which Kuşadası is named. There is also a shopping area adjacent to the port. Kuşadası is a delightful getaway and a highlight of our trip. 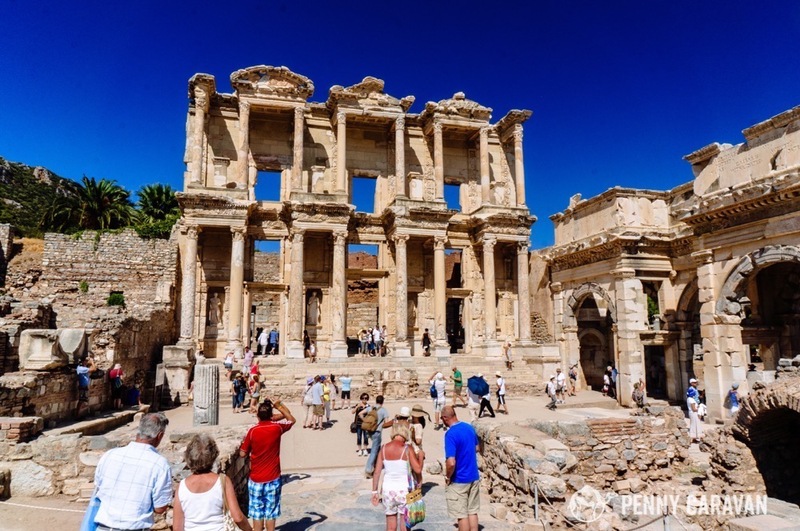 We’re glad we chose to visit Ephesus from Kuşadası, and saw firsthand why it’s such a popular destination for Europeans looking for a beach getaway. Are you thinking about going to Ephesus? 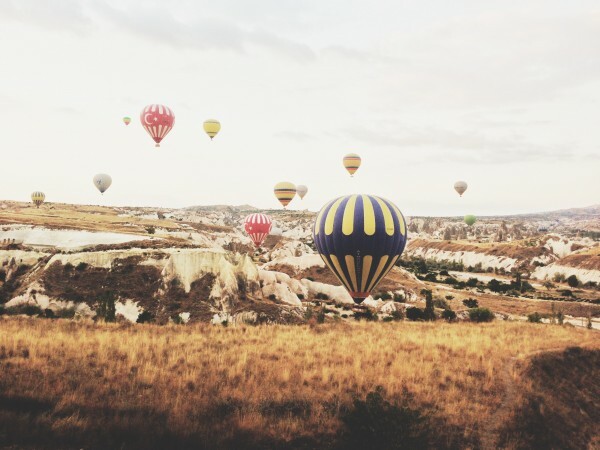 Does a trip to Kuşadası sound like the right way to get there? Let us know in the comments!